Attention all students! Are you artistic? Do you like books? 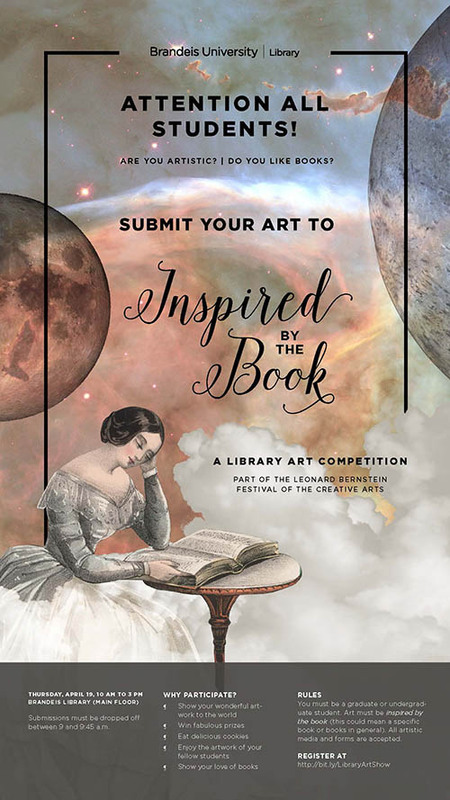 Submit your art to “Inspired by the Book: A Library Art Competition” (part of the Bernstein Festival of the Creative Arts). When: Thursday, April 19, 10 a.m. – 3 p.m.
Why participate? Show your wonderful artwork to the world! Win fabulous prizes! Eat delicious cookies! Enjoy the artwork of your fellow students! Show your love of books! Rules: Art must be INSPIRED BY THE BOOK (this could mean a specific book or books in general). All artistic mediums and forms are accepted. Submissions must be dropped off between 9 – 9:45 a.m.